Why Do Some Kids Need Extra Learning Activities? So many kids these days are getting therapies, extra learning activities, extra lessons and additional intervention. Often parents ask why this is the case - and is it really necessary? Jump to the section you want to read or scroll through it all! Which learning activities will help my child? Many children nowadays are growing up in a world which has not allowed them to climb trees, get messy and explore their environment in the ways which developed the skills of yesteryear's children. Sometimes gifted children pursue their areas of strength at the expense of their other skills, and these other skills need to be brought up to par in order to ensure a more balanced individual. A boom in cross-cultural adoptions has seen many parents seek activities to stimulate children who may not have received adequate stimulation in their early years. Some children have also experienced birth trauma, which may have affected their acquisition of skills. Others, through no fault of their own, may not have had the opportunity to acquire skills through a lack of resources. Use the navigation bar on the side of my site to find different categories of learning activities that may help your child. The type of activity to focus on will depend on skills that you think your child still needs to learn, or skills that your child's teacher has asked you to focus on. This page is a good place to start if you want an overview of the activities that can build the skills needed for reading and writing. All of these fun activities have a specific focus. By understanding how each activity builds the necessary skills, you will know that you are really helping your child develop the necessary skills. Most of the resources that you will need are already lying around your house, or easily obtainable at a supermarket. If your child is struggling with any skills, please seek advice from an occupational therapist or other professional. You can ask your child's teacher or your health professional for some referrals. An occupational therapist will be able to assess your child and see exactly where the problem is coming from. For example, if your child's handwriting is poor, the occupational therapist will try and identify which factors are affecting your child's handwriting and then plan therapy activities and home programs accordingly. To give you an idea of how different factors can affect a child's skills, take a look at my article on factors affecting handwriting. An occupational therapist will also plan activities that are just right for your child and will advise you on what activities you can do at home. 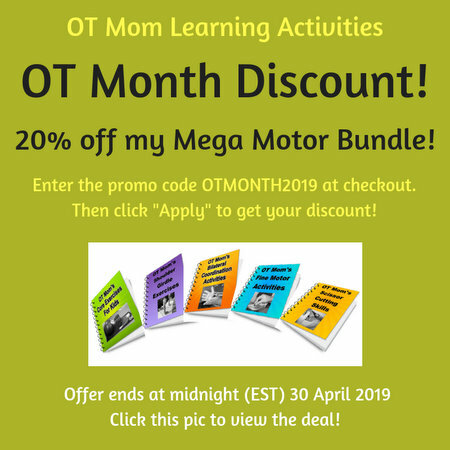 Read more about the difference between doing learning activities from my site and having occupational therapy intervention. Try my e-books to enable you to access my activities directly from your own device anytime you want!